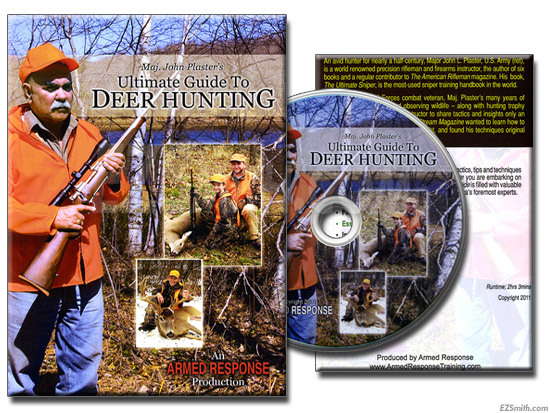 The Ultimate Guide to Deer Hunting offers valuable tactics, tips and techniques for the novice and experienced hunter alike. Whether you are embarking on your first hunt or seeking to sharpen your skills, the Guide is filled with valuable insight on gear, planning and hunting by one of America’s foremost experts. An avid hunter for nearly a half-century, Major John L. Plaster, U.S. Army (ret), is a world renowned precision rifleman and firearms instructor, the author of six books and a regular contributor to The American Rifleman magazine. His book, The Ultimate Sniper, is the most-used sniper training handbook in the world. A U.S. Army Special Forces combat veteran, Maj. Plaster’s many years of stalking, studying terrain and observing wildlife – along with hunting trophy deer – makes him the perfect instructor to share tactics and insights only an expert could convey. When Field & Stream Magazine wanted to learn how to stalk deer, it was Maj. Plaster they sought, and found his techniques original and effective – just as you will.